Cambodia's modem-day culture has its roots in the 1st to 6th centuries in a state referred to as Funan, known as the oldest Indianized state in southeast Asia. 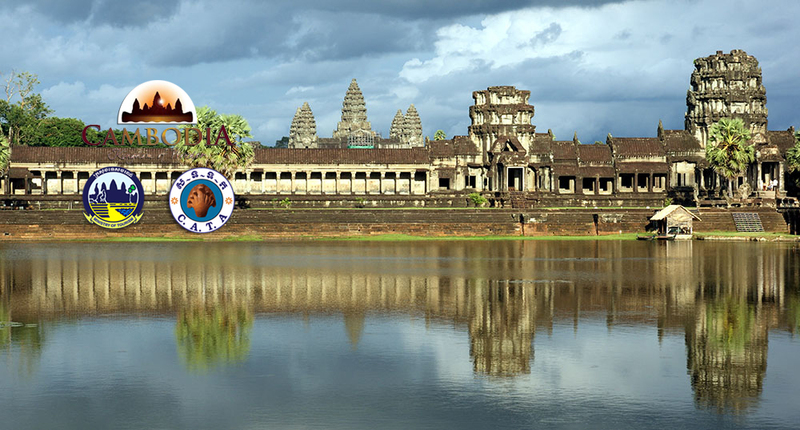 It is from this period that evolved Cambodia's language, part of the Mon-Khmer family, which contains elements of Sanskrit, its ancient religion of Hinduism and Buddhism. Historians have noted, for examples, that Cambodians can be distinguished from their neighbors by their clothing - checkered scarves known as kramas are worn instead of straw hats. Funan gave way to the Angkor Empire with the rise to power of King Jayavarman II in 802. The following 600 years saw powerful Khmer kings dominate much of present day Southeast Asia, from the borders of Myanmar east to the South China sea and north to Laos. It was during this period that Khmer king built the most extensive concentration of religious temple complex. The most successful of Angkor's king, Jayavarman II, Indravarman I, Suryavarman II and Jayavarman VII, also devised a masterpiece of ancient engineering: a sophisticated irrigation system that includes barays (gigantic man-made lakes) and canals that ensured as many as three rice crops a year. Part of this system is still in use today. The 15th to 17th centuries represented a time of foreign influence, when expansionists Siam and Vietnam fought over Cambodia. By the mid- 1800, Cambodia, like most other countries in Asia, came under increasing pressure from European colonial powers. In 1863, the country agreed to protection from France. King Norodom signed a Protectorate Treaty between King Norodom and the French. The geographical framework of Cambodia is found bordered by the Gulf of Thailand to the southwest, Laos to the north and Vietnam to the east and southeast. Its main artery is the Mekong valley, which crosses from north to south. This is joined at Phnom Penh by the Tonle Sap, spreading to the northwest in a large plain of water that extends for some 140 kilometers by 30 and irrigates the surrounding plains. Every year the weather varies from 23°C to 32°C with an average temperature of 27°C The maximum temperature is 40°C in April and lowest temperature is 11°C to 18°C in January. In Cambodia the high temperature increases to 220 days per year. There are two seasons clearly: dry monsoon (from October until April) and raining monsoon (from May until September). 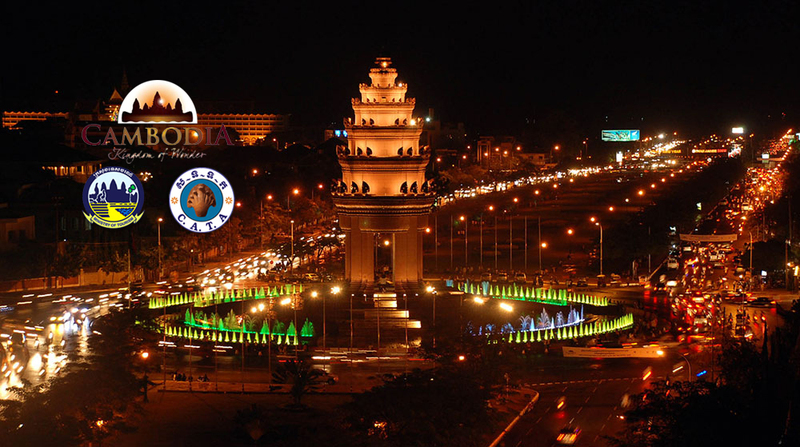 Population and area: Cambodia has a population of 14,952,665 (July 2012 est.) people in an area of 181,035 square kilometers. The official language is Khmer . English and French are widely spoken and practical in conducting businesses. Government offices open from 8:00 AM to 5:00 PM on weekdays only. The lunch break is from 12.00 AM to 2.00 PM. Banks open from 8:00 AM to 3:00 PM. Standard voltage is 220 volts. Riel is an official currency. Dollars, Visa Card, Master Card, American Express and traveler's cheques in dollars are widely accepted. International departures: US$ 25. All other domestic destinations US$ 6. Rice and fish are the staple diet and the harvest is regulated by the rhythm of the rains and floods. The fish are plentiful. During the dry season, and entire village is built on Tonle Sap Lake. Their belongings suspended on the poles with rachs of dried fish. There are other many kinds of food made of mixed-vegetables cooked by using red meat or pork or seafood. There are cars and motorcycles for rent in the city. Rickshaws and taxi's are also available. Travelers can travel by air, car, boat or train to get from one province to another. Mobile phones are widely used. Phone cards can be used on both mobile and regular telephones. Public phones with phone cards are common in Phnom Penh. Phone cards can be purchased at most hotels, post offices and supermarkets.